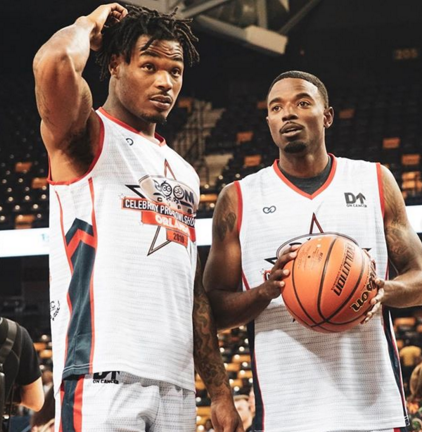 When fans filled the CFE Arena on the campus of the University of Central Florida in Orlando on Saturday night for the 2019 Celebrity Pro-Bowl Showdown presented by Boom Cups, it was their chance to watch current and former NFL players, music artists, entertainers, and social media influencers take to the floor all for a good cause. 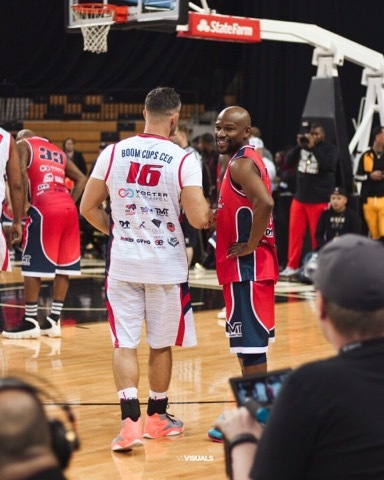 Featuring former NFL running back Chris Johnson hosting his charity basketball to benefit the Chris Johnson Foundation and D-Up On Cancer, the event was headlined by legendary boxing champ and promotor, Floyd Mayweather, who did not shy away from the spotlight or a challenge from 17-year old point guard, Julian Newman. A junior at Downey Christian School in Orlando and ranked amongst the best high school guards in the country, Newman wasted little time in calling out the champ — a cross over, a floater, a spin move for a lay-up. Newman went blow for blow with Mayweather (who showed off his own scoring touch) on the night and came away with a number of highlights and headlines to show for it. The game included a halftime performance by Rick Ross, while NFL stars like Mike Evans (Tampa Bay Buccaneers) and Derwin James (Los Angeles Chargers) left their mark on the charity game prior to shifting their attention to Sunday’s NFL Pro Bowl game in Orlando. 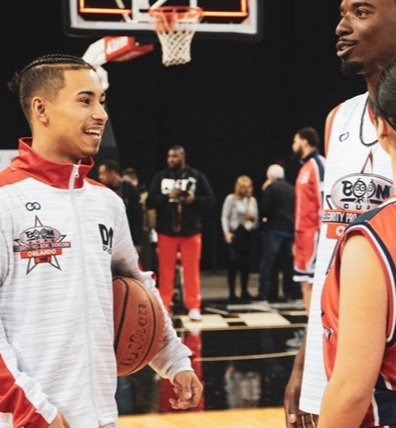 For Wooter Apparel, the charity game was more than just an opportunity to once again team-up with Boom Cups in creating and producing the customized white, red, and blue warm-ups and uniforms for the players, but it also presented the stage for Wooter to help give back in Orlando. At the end of the game, two checks for $2500 were presented by Boom Cups CEO Michael Mak to the Chris Johnson Foundation and D-Up On Cancer. 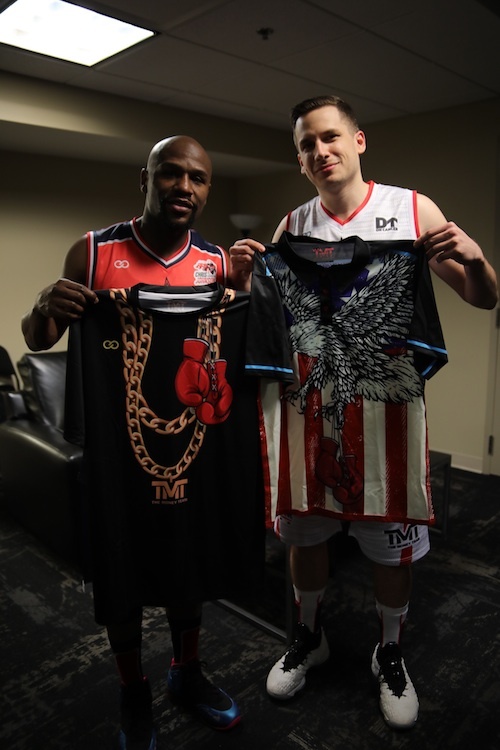 The Champ Is Here: Alex Aleksandrovski, Co-Founder and CEO of Wooter, presents Floyd Mayweather with some customized TMT merch from Wooter Apparel. "After years of sleepless nights and hard work, we've gotten Wooter to a position where we can positively impact the world. We understand sports plays a massive role in bringing communities together and shaping the lives of our youth,” said Alex Aleksandrovski, Co-Founder and CEO of Wooter. “Our team is pledging $2.5M over the next 3 years towards donations and sponsorships for sports programs all over the world." Previous donations and sponsorship recipients have included Wooter Africa, Ballin 4 Peace, Each One Teach One (at Rucker Park), Irvington High School (Irvington, New Jersey), Ballin 4 Lupus, and Smush Parker’s Basketball Camp. For their “commitment to providing financial assistance to local teams and athletes”, Wooter was recognized by the City of Long Beach, County of Los Angeles, and the U.S. House of Representatives for their involvement in sponsoring the BOSS Program (Business of Success Beyond Sports) in 2017 and now look forward to continuing on their give back mission over these next three years. “As a leader in the sports industry, we believe Wooter has a responsibility to give back to the same people who helped get us here,” Aleksandrovski continued.